Buy Home Depot Stock Before Q4 Earnings Tuesday? Home Depot (HD - Free Report) shares have climbed over 11% since the start of the year, along with the broader market. Despite this climb, shares of the home improvement power rest roughly 11% below their 52-week high. Let’s see if investors should consider buying Home Depot stock on a slight dip ahead of its Q4 2018 earnings release Tuesday. Home Depot is scheduled to release its fourth quarter financial results before the opening bell on Tuesday, February 26. Fellow retail powers including Macy’s (M - Free Report) and rival Lowe's (LOW - Free Report) are also expected to announce their holiday quarter results next week. And investors might expect big things from Home Depot and other retailers after Walmart’s Q4 results helped prove that its e-commerce push has paid off as it tries to combat Amazon’s (AMZN - Free Report) encroachment (also read: Buy Walmart Stock After Blowout Holiday Quarter Earnings?). 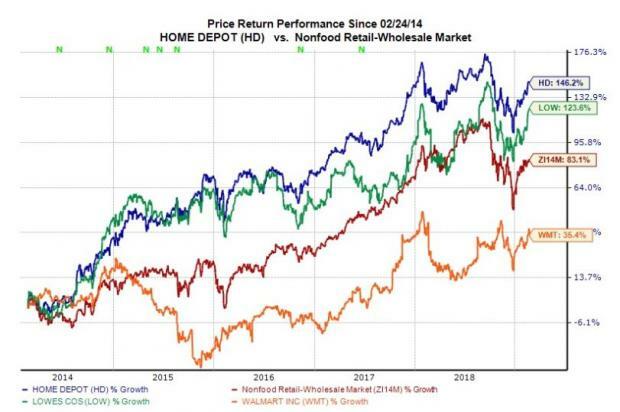 We can see that Home Depot stock has outperformed LOW, WMT, and its industry’s average over the last five years. On top of that, Home Depot is currently trading at 18.7X forward 12-month Zacks Consensus EPS estimates, which marks a discount compared to its industry’s 25.5X average. HD is also trading below its five-year high of 27.1X and its five-year median of 19.9X. Therefore, we can say that Home Depot’s valuation picture is hardly stretched now. Moving on, Home Depot’s Q4 revenues are projected to jump 11.2% to reach $26.56 billion, based on our current Zacks Consensus Estimate, which would crush last quarter’s 5.1% top-line expansion and come in on top of the year-ago quarter’s 7.5% revenue growth. Meanwhile, our NFM estimates call for HD’s comparable store sales to climb 4.5%. This would fall somewhat in line with Q3’s 4.8% comps growth and show that the company seems to be headed in the right direction after Q4 2017’s 7.5% same-store sales growth.